Speaking out against President Trump's recently approved travel ban involving predominantly Muslim countries, protesters gathered in downtown Orlando Thursday afternoon in front of Sen. Marco Rubio's office. The "The NoMuslimBanEver" rally was hosted by the Florida Chapter of the Council on American-Islamic Relations (CAIR-Florida), alongside several other groups affected by the ban. At the very beginning of the event, one of Marco Rubio's office representatives met the speakers outside to organize a meeting at another time and place. He refused to speak on the microphone or share his name publicly. "All of us went through the motions of what will go down as yet another dark day in American history," said Rasha Mubarak, CAIR-Florida’s Statewide Social Justice Advocate. "By upholding the Muslim ban, the Supreme Court gave life and bearing legitimacy to the wave of Islamophobia American Muslims are experiencing in America today. However, we will not back down." 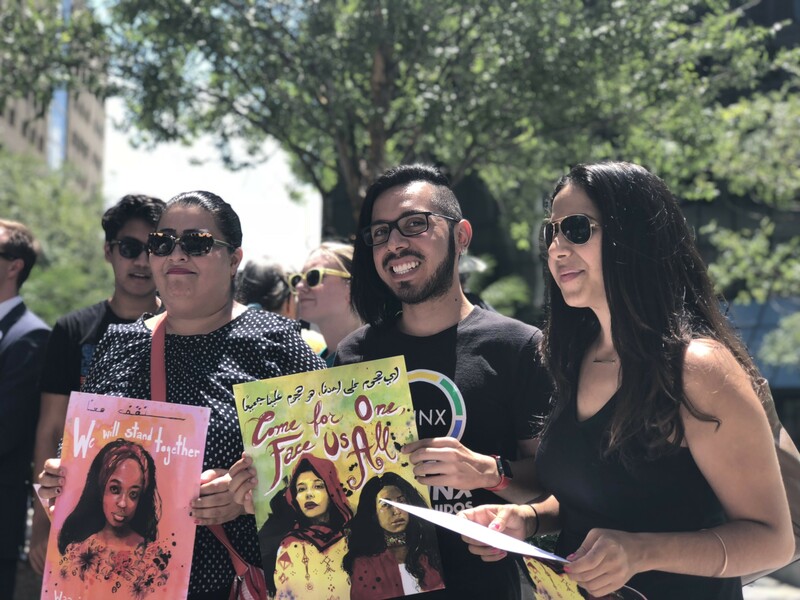 Other groups present at the event included the Muslim Women's Organization, Organize Florida, QLatinx, Trust Orlando Coalition, Florida Immigrant Coalition, Hope CommUnity Center, ACLU of Florida, Central Florida Jobs with Justice, Mi Familia Vota and Latino Justice. The groups spoke of regaining strength in a time of despair and the need to vote in the upcoming election in an effort to protect one another. "You can't just sit at home on your couch and say that this is wrong," said urban planner Sarah Elbadri, who ran for Orlando City Commission last year. "You need to come out and vote, and more than that, you must mobilize." This crowd gathered just two days after the Supreme Court upheld a travel ban set forth by President Trump – one that bans refugees and immigrants from five Muslim-majority countries – in a 5-4 vote. Those countries are Syria, Iran, Yemen, Somalia, North Korea, Venezuela and Libya. At the end of the event, participants entered a prayer circle to take a moment of silence and connect with one another. If you missed today's rally and immigration reform is something that's important to you, here are plenty of other useful and local ways to help.